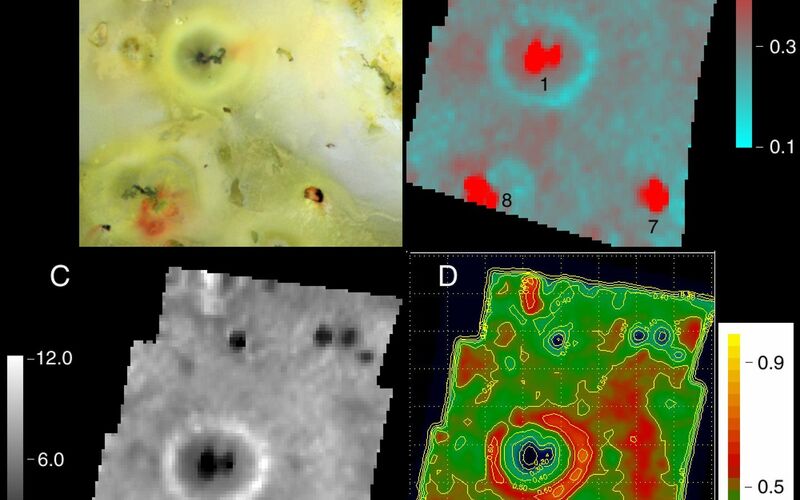 The Prometheus region of Jupiter's moon Io was imaged by the camera onboard NASA's Galileo spacecraft in July 1999 (A), and by the spacecraft's near-infrared mapping spectrometer during its October 10, 1999 flyby (B). The maps made from spectrometer data show the interplay between hot silicates on the surface and sulfur dioxide frost. 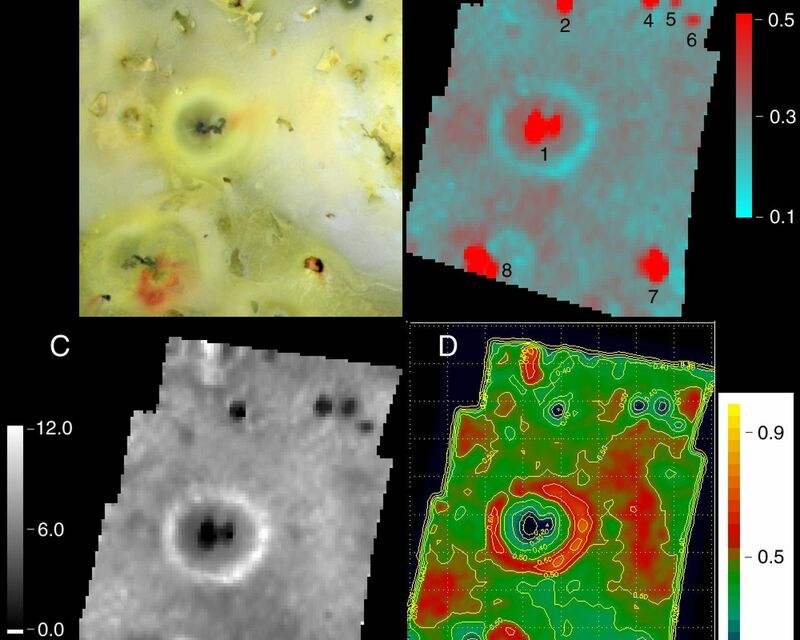 Hot spots (active volcanoes) appear red in the spectrometer image (B), while sulfur dioxide frost appears blue. Hot spots known from prior observations are labeled 1 (Prometheus), 5 (Camaxtli), 7 (Tupan) and 8 (Culann). Hot spots labeled 2,3, 4, and 6 were first discovered in this observation. The color bar scale in (B) represents radiance in units of solar irradiance/pi. The sulfur dioxide deposition ring around Prometheus is clearly seen in the center of the image, formed as sulfur dioxide from the currently active plume condenses away from the vent. Image (C) is a map of the relative band-depth of the sulfur dioxide absorption band that is detected by the spectrometer. 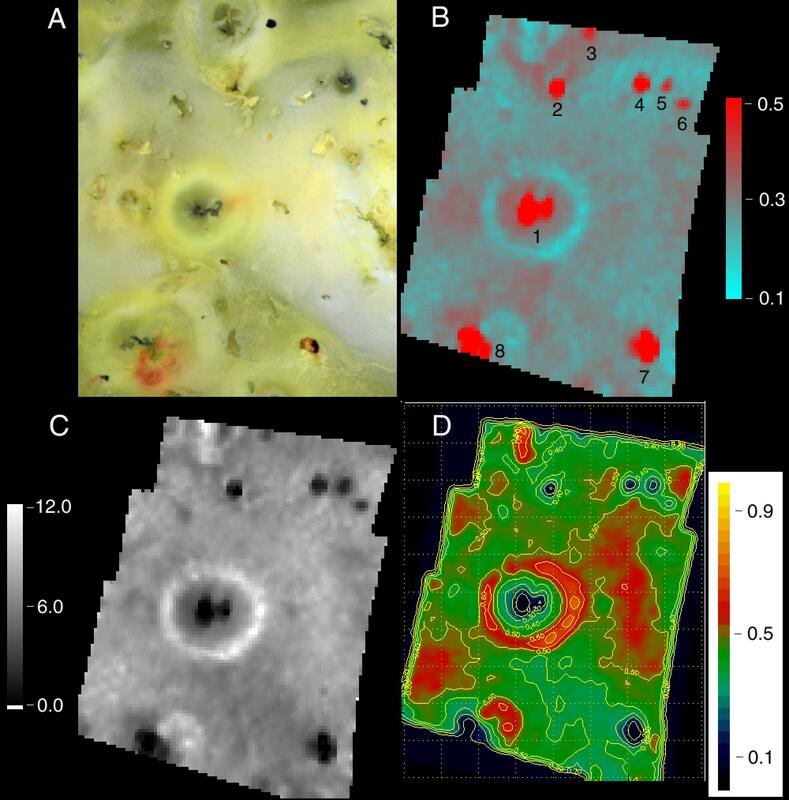 Image (D) is a qualitative map of the distribution of sulfur dioxide frost on the surface. The color bar in (D) represents the fractional area covered by sulfur dioxide frost. The area shown in each panel is about 1,300 km (800 miles) across.